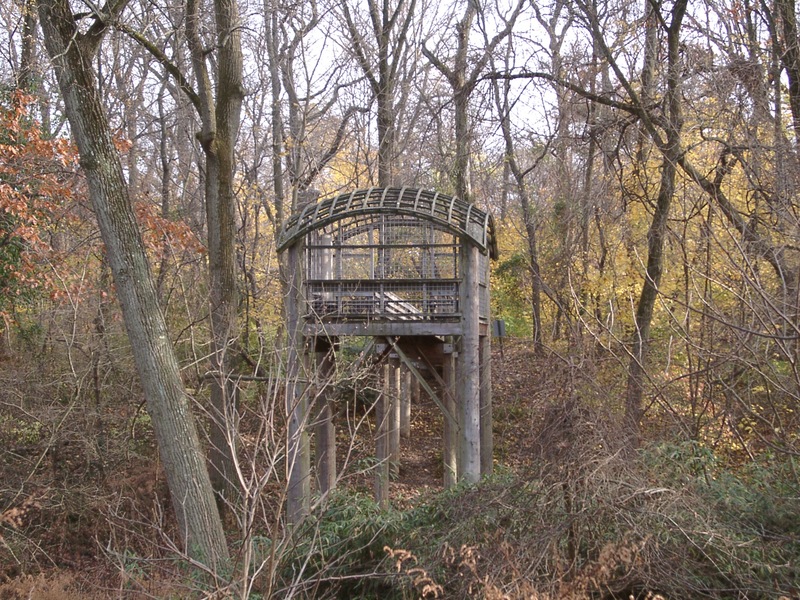 A couple of things occur to us about this artful structure in the woods, which is, as its dedication plaque reads, “ a public amenity designed by artist Martin Puryear.” First, that the word “amenity” is not in common usage these days, perhaps since so much of what we are exposed to is not just for the purpose of being pleasant or agreeable, but rather has underlying motives in most cases. This lovely pavilion, however, was designed to exist purely for our enjoyment. And it does. 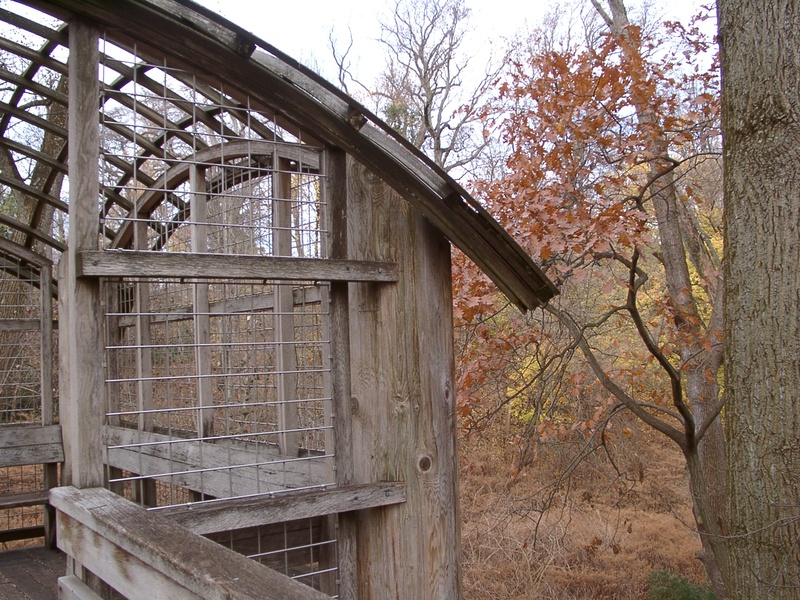 And, second, that in a more perfect world this lofty, hidden crow’s nest of an observation tower would not have to be so caged, so protective against our worst instincts – but this is humans we are dealing with. It is hard to describe the visual imagery suggested by the work. Of course, it is architecture since it is self-supporting, has a floor and roof and walls. And, absolutely, it is a kind of treehouse: in the trees, built of trees, observing and being observed by the surrounding trees. 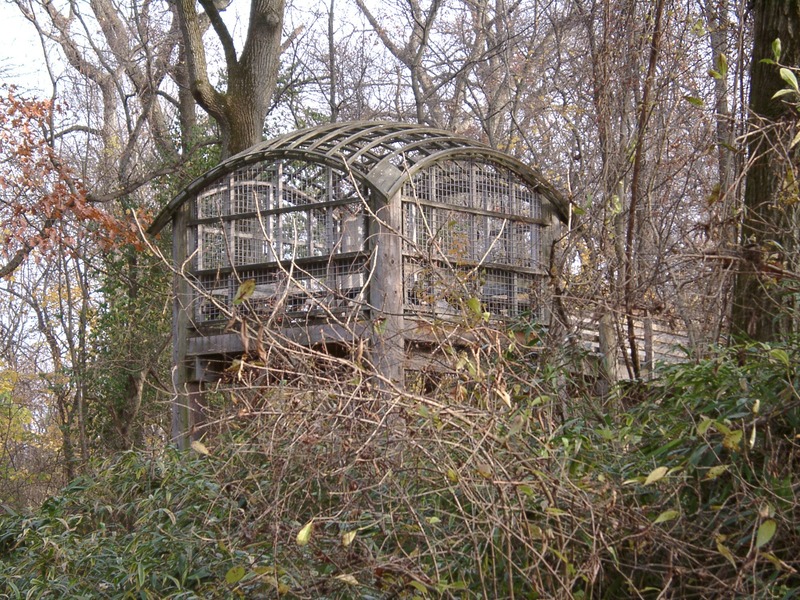 As architecture, too, it has resonances of African or Native American grain- or corn-storage huts – cute sheds supported on stilts to keep out vermin. Too, there are echoes of boat-building: on piers above the water table, the ship’s gangway that connects it to dry land, the rounded shape of the ribbed frame of an overturned vessel. But there are animal-like references, too, in the leggy supports that are avian: flamingos, stilt sandpipers, herons. Mostly though, there is something elephantine about the form and stature of this forest-grazing giant: the grayed color, the scale, the curving “back,” the thick legs and the long trunk-like access ramp as it extends to lift you up. Locating it is not easy since it blends so well into its site, no directional signs or pointers offered as aids to guide you, and seeing its back through the woods, if even possible, doesn’t really clue you in on how to get to it. As it stands in a basin and rises two and a half stories to about midway up the tallest trees, it is of human-scale, a platform in among the arboreal high-rises. 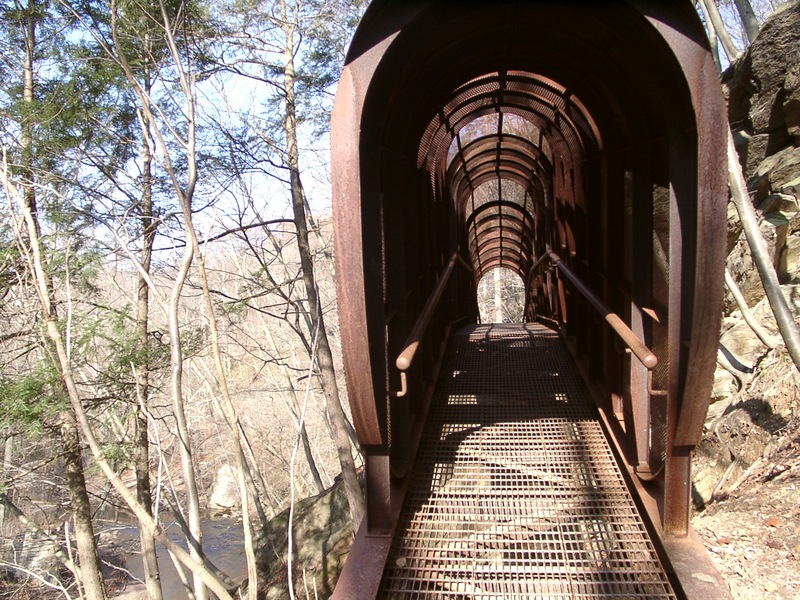 The entrance ramp is a bridge that goes halfway across the gorge, its termination point is this viewing station, the pavilion. The ramp and its destination are enticing, seductive, a kind of inviting chute leading you up, offering a ceremonial approach that lends its own views of the environment around and below as you make your ascent. There is a sensation of entering an amusement ride as you climb up to the waiting “car,” a kind of cage with bench seating all around. You feel as if, when you sit down, there will be an announcement to buckle yourself in before takeoff. Inside, the pavilion has contained but open space, a series of grids in wood and steel, like an open weave of a basket or nest – it does offer, after all, a bird’s-eye-view – and a domed open-grid roof that reflects the curvature of the sky above the Earth. All around are bird sounds, rustlings in the reeds below and a faint trickle of a tiny creek. It is a feast for the senses, being surrounded by nature at this height. Light, filtered by the canopy of trees, is all around, the breeze enters and exits the room with ease. The experience is exhilarating. 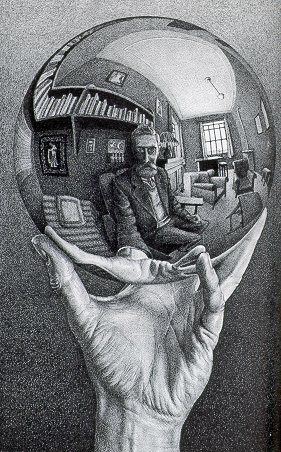 Your view is 3-dimensional; up, down, north, south, east, west. It isn’t that you can see for miles – that isn’t the point: it is total immersion in the park, in nature, seeing and feeling what is real and immediate and being a part of it, in fact, losing your sense of self to it and becoming attuned. It is a wonderful ride. The structure is well-crafted but it is so much more: it is not just about the structure, but, rather, what the structure enables you to experience – a skeleton of inner space and, mostly, a vast yet intimate outer space. It has very much the same effect on the beholder, too, if you allow it to happen – a wonderful framework for viewing both in and out. An amenity, really. We were watching a documentary on TV the other night about sacred places, and the narrator, in trying to define them, or have us understand the concept, said that each of those sites to be examined was “a place that, by simply being there, we are changed.” Strangled sentence structure aside, there was something else about that statement that bothered us: We think it’s wrong. In our arslocii quest, what we have discovered – or happened to learn, that is; we are surely not the first to realize this – is that when you come upon a location that is sacred or spiritual, or, as in our case, is art or contains a placeness that is art, and you are affected by it, it is not because you are changed but rather because you recognize yourself in it: not changed but found. It is not so much that these places speak to us, as the phrase goes; it is that we speak to ourselves, in intimate tones only we know how to make or understand. Being in or looking at the place, or a portion of the place, does not add to us so much as it uncovers an aspect of us already within us – it flicks a switch that activates a dormant part of us, or one that hasn’t been paying much attention, and awakens it as if from a dream, or focuses it. And we say to ourselves not “how unusual” but “I know this – this is me.” The place makes you not different but more yourself than you knew you could be. And this, then, offers a train of thought that leads to or suggests that what captivates us about a place – that engenders in us a sense of placeness – is not a critical analysis, or aesthetics, or even history. What it is about is empathy; that empathy — the ability to feel an other through identifying with it – might be at the heart of not only appreciation of art and place but the creation of them, as well. When we are in a place, or look at a work of art, and it leaves us cold though it be beautiful, it is not because we say to ourselves, “This is uninteresting,” but rather that it does not already live within us – not so much mirror us, or be created in our image, but reflect our reflections, spark our recognition, be the sound sent to us that strikes off our soul and then echoes back, and back again. Not a dialogue, not a soliloquy, but more like a duet. Like turning a corner and seeing someone you know is your twin, or soul mate – someone who was always there, you’d just never met face to face. Experiencing placeness as art, then, is not anything that has changed you but, instead, is an awareness of fulfillment, a piece of the jigsaw puzzle (that is your heart and mind) moved from the pile to its position within the evolving picture. Art is not something you look at; art lives inside you, waiting for those wondrous moments when it finds a calm, deep pool, and looking in looks back. We could say that all life on this planet, and also the planet itself, are results of chemical reactions – combustions of one sort or another – elemental combinations working in tandem to produce interactions and effects. So, what is it about certain chemical events, like fire – a rapid exothermic oxidation that produces heat and light, the dictionary tells us – that create a kind of awe and wonder, and sometimes even fear, in us? There is, in fire, one of the four elements of the alchemists, usually a compelling seductiveness, an immediate fascination with a controlled burning fuel. The question is: Can a fire, in this case a wood-burning fire, have placeness? Growing up, my grandmother had a coal furnace. A huge diving bell-shaped thing with octopus tentacles of ductwork flailing out toward registers in the basement ceiling. Not scary, there was a benevolence about the strange iron-clad creature with its heavy hinged doors that squeaked from weight – draft-inducing doors, coal-feeding doors, ash-removing doors. It was alive and, yet, not. Alive with sounds as well as warmth, but mostly alive with its glowing innards: hot embers, flickering flames, wiggly shapes – apparitions that would elongate, shorten and disappear, only to re-emerge in another spot; colors both hot and cold and ever-changing. I know this because, for entertainment, my grandmother would place a wicker rocking chair in front of the behemoth furnace, open the coal-feeding door, hold me on her lap, and we would sit and enjoy the show and the warmth – like a private dance recital. It was magical and also hypnotic, it was primal hearth and home. There is no place like it. The funny thing was that up in her living room was a gas fireplace which was rarely used. It could have been an economic choice of fuel but, based on the few times I saw it, it was no match for the coal-eating giant downstairs. Gas was more even in its burning, so there was not much variation or surprise in its effects. It was dull. And it didn’t give off the heat, the kind that can redden your face if you sit too close. It was style rather than substance, not the harnessing of life itself. 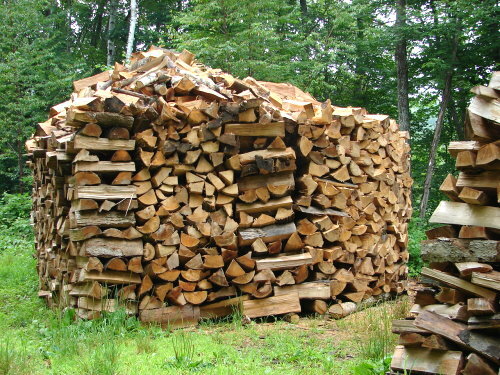 Someone has said that a wood stove heats you twice: once when you chop the wood and again when you burn it. There is something very hands-on about wood fires that allows you to have an intimate connection both with the process and the result. There is also that rush of power and exhilaration in creating fire, creating life in a sense. Maybe not quite as intensely felt as when it was first discovered as a manmade endeavor, but there is a primitive memory recall of that event each time you ignite one, even in the 21st century. No matter how many times you make a fire, it still has an element of magic to it. And, although coal has its own style of burning that is very glowy, the most dynamic and varied and living is wood. There is a thereness to a wood fire. Different woods burn differently and create varied color palettes in their incineration, so the mixing of soft and hard woods is, in a sense, putting a visual buffet together. There are short-lived bursts of red-orange sparks that pop and sputter like tiny fireworks, and the usual yellow, orange and red spectrum of flames – a result of incomplete combustion that together produce an incandescence. Ironically, the hotter the color, the cooler the flame, with white the hottest and red the coolest. And, somehow, the complete burning of a gas produces blue. Not that any of this matters in the sensory display. Color just enlivens the already animated process: one of drama ever changing. 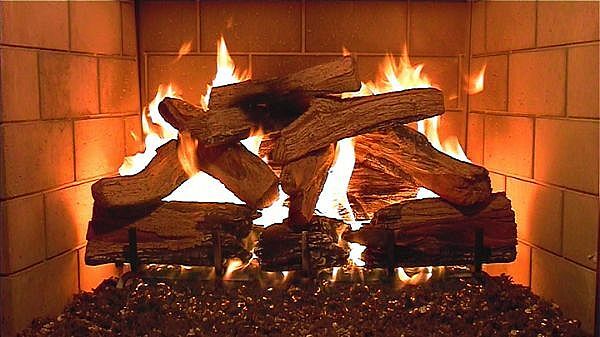 Mostly it is the presence of a wood fire that matters, just like the presence of any living thing. In addition to the visuals, there are the sounds: the hisses and pops and the retraction of the wood that causes shifting and settling. But there is also that roar, the intensity of the energy release – a kind of release of the spirit, a giving up of the ghost of this carbon-based, once-breathing living entity. Its power is palpable as it sacrifices its warmth to you. There is a joyful sadness to the process of exchange. The fire creates its own sense of space, as in a theater, it being at center stage, and also having its own built-in spotlight. In a sense, it holds court. Its purview is the area it heats, like the throwing out of a net of radiation and comfort and snagging us in it. It is the sun that we orbit around since we are warm-blooded planetary masses; in the presence of a fire we are a retinue of bodies, satellites held in magnetic pull by a powerful star. But the added attraction is the mesmerizing nature of a fire – the artful play it provides. Acting as its own conductor of a visual orchestra, every composition is unique. In a sense, like observing an action painting in process, it both creates and expends energy; it is its own source and exhausts itself completely. And it is exciting not only for its transitory nature, but also for its volatility – its power unleashed a fearsome prospect. It has its own sense of self and controls and affects whatever environment it occupies. Generally speaking, wood fires take place in a specific spot, in a stove or pit for this purpose – a kind of ritualistic point of occurence that adds to the magical nature of the process and all the primal connotations that derive from it. It is this combination of the container and contained that partners in an arslocii way, producing something greater than the two parts. But, also, the idea of “containing” one of the four elements, especially such a combustible one, is awesome, and it creates an aura of unpredictability and a unique relationship between nature and nurture. It is the interconnectedness between the fire and its site, usually central – the heart is as the hearth, being the vital place in a home that gives meaning, and along with it, the relationship of the viewer to it. The fire dwells as much in your house as you do; not merely a place, but a place creator. At its most basic, it is heat, but it offers so much more. There is every reason to be confident, at any given moment, that it will happen, but we no longer embrace its promise and possibilities the way we used to, certainly not in the long-term: Our future is measured, it seems, in just weeks or months, the metric being the release dates of upcoming new electronics or software upgrades, or the disappearance of ozone or ice. These days, we more easily dwell in that foreign country of the past, finding comfort even in its anxiety, and vice versa. The past is soothing to us because we have made it through it more or less intact, and that’s where our loved ones will always be alive. The present demands choices, and the future is not predictable, and often, not even imaginable. Philosophically, now – this very split-second – is all that is real, and yet, in early 1939, the future was just as real, and, in one specific location, past, present and future were all lived at once: a temporal convergence not seen before or since and likely never again, that resulted in an explosion of pure optimism or, at the very least, great pleasure. It was a grand place to be; in imagination, it still is. 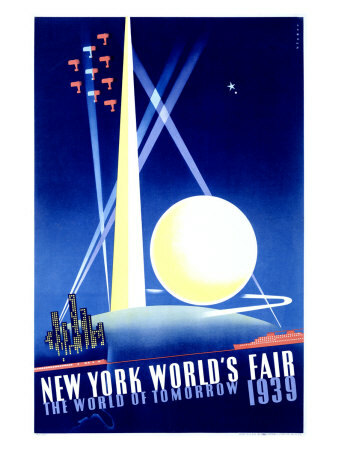 That the 70th anniversary of the New York World’s Fair slipped by most of us last year around this time is something of a shock, considering its place in American history, its signal influence on invention and design, and its symbolic balancing on the precipice of hope and war’s crashing bleakness: In terms of the road of faith in progress’ benevolent patrimony, it was the last stop before tolls. 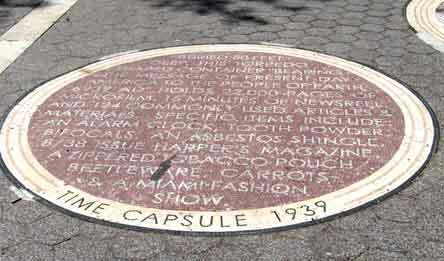 Twenty years ago, for the Fair’s 50th anniversary, a celebration and memorabilia sale was held at the site of the ’39 exposition, in Flushing Meadows-Corona Park, Queens. 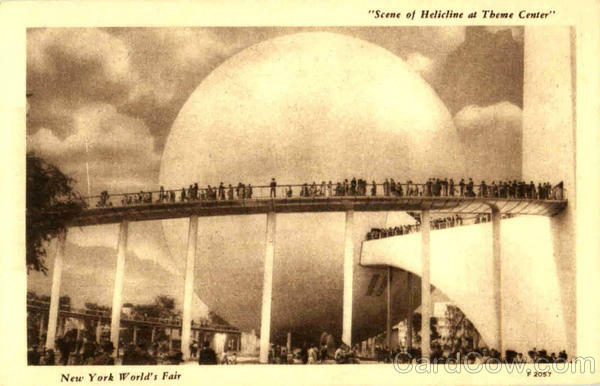 In the existing park, there wasn’t much left of that fair, or the one in 1964 put up on the same spot: just the huge globe called the Unisphere from ’64; the time capsules set in place in the ground at each fair, 25 years apart, to be opened by our descendants 5 centuries from now; a few recreational facilities; and what was once the New York City pavilion used for both events, but which is now the Queens Museum, home of a spectacular room-size, 3-D replication of New York City, and, in 1989, ground zero for the anniversary festivities. Attended by some who built the Fair, others who’d attended it, and most who only dream about it, are moved by it and curse the unfortunate timing of their births that caused them to miss the experience of it. Being there, as we were, despite the near-barren grounds, one could try and succeed (squinting a little helped) in envisioning this Oz within view of the larger Dream City just beyond to the west, this now-ghostly Fair: the Promenade, and all the excited folks strolling down it (in the past, people strolled – it was a favorite form of perambulation, not a waste of time); the dancing waters of the Lagoon of Nations; all the streamline moderne and kitsch corporate buildings, some looking like the products they were pushing (although it was progress, not sales, that they claimed to be espousing). And, of course, the Fair’s theme building and centerpiece, the continually seductive, classically inspired, and still-ahead-of-its-time symbol of the new age/space age/scientifically enlightened age to come: the elongated pyramidal Trylon soaring to the sky, and the grounded, bulbously tactile Perisphere. Today, none of it there, yet magically present. That was 20 years ago. Last year, for the 70th anniversary, what passed for a celebration took place in an airport hotel near LaGuardia. A comedown, certainly of style — and, after all, wasn’t style what 50 percent of the Fair (and, generally, life) was all about? As the fair recedes in time, and living memories die, the dream of this Camelot, this congenial spot of happy ever-aftering, made legendary by its programmed impermanence, devolves — except in the hearts of a few loyalists — into little more than fluctuating price lists for collectibles. And now we are approaching the 70th anniversary of the fair’s second season, one of the most disappointing of sequels. 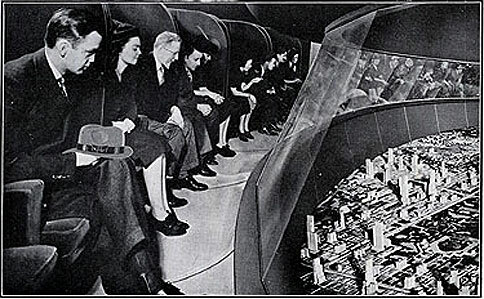 Perhaps a more direct harbinger of the real future, much of what made the Fair a joy in ’39 was gone in ’40; the focus shifted to the amusement park and sideshow areas that had once been the secondary, seamier but popular side of the enterprise. By spring of 1940, when what remained of the ideal future reopened to try to squeeze more money from the curious or idle to help defray the losses incurred by Season One (who said art pays? ), the Nazis had taken Poland, Europe was descending into fear and darkness, and the moral and political undertow of involvement was dragging us out beyond safe shore. In bitter irony, the metal substructure of the Trylon and Perisphere would soon be melted down to make the stuff of wars. Also ironic: even as our symbols of great expectation became scrap, we were never so unified as a nation as in our war efforts. A place in the mind is as much one dwelled in as any other, and maybe more so, because it is what you want it to be, or need it to be, and you can walk it, and smell it, and taste it, and be there with whomever you want to be, whenever you want. We are not in such dark times now, as then, but we are not in such bright ones, either. 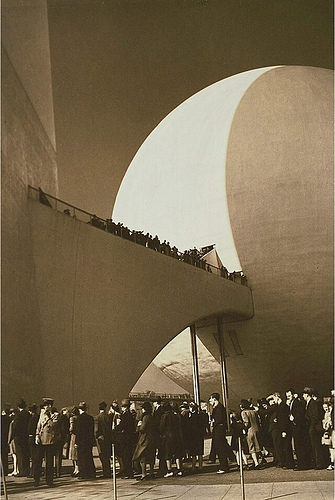 The 1939 World’s Fair was, by its own reckoning, The World of Tomorrow. We could use one today. 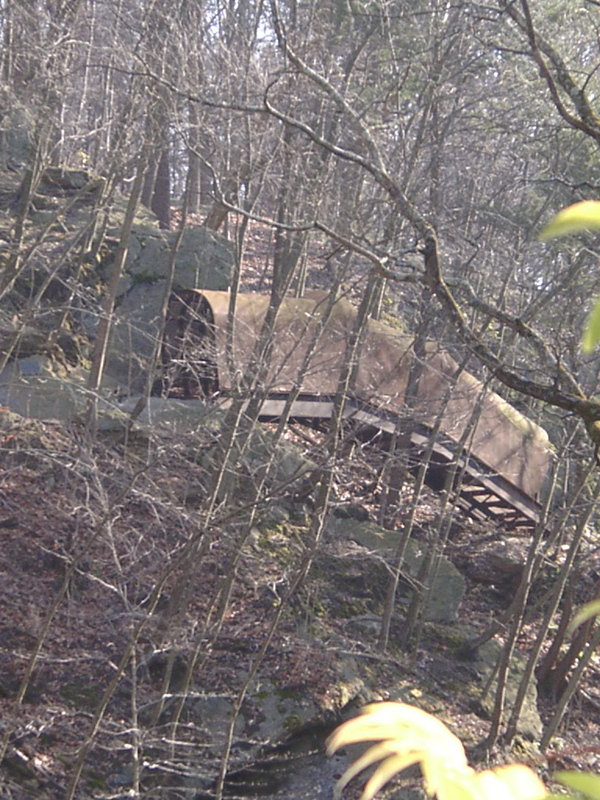 This strange cliff-face, creek-side bridge over a gorge is one of the most unique pieces of functional artwork that one might encounter anywhere, but especially unusual in a “wilderness” city park – which is unique in and of itself. 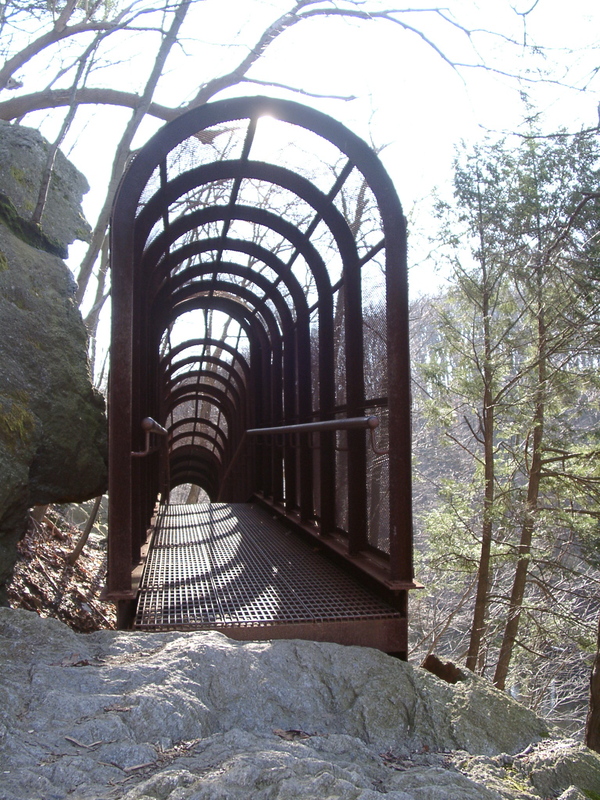 Fingerspan is the work of artist Jody Pinto, commissioned for Fairmount Park’s Wissahickon Valley for the purpose of connecting a path on two sides of a massive split rock outcropping high above the creek bed. It is remarkable that such an effort was made solely for allowing a contiguous trail, perhaps an old Indian trail, to follow along the creek, rising and falling as the terrain roller-coasters parallel to the water on a steep north bank. The first challenge is to locate it, the second is to get to it, and the third is to trust it – but, be assured, there is nothing else like it or the experience it provides in its partnership with its natural surroundings, as an up-close-and-personal appreciation of the rugged environment, except maybe the stairs and observation deck at Niagara Falls. It is both a bridge and a tunnel, a tunnel that, instead of funneling light at both ends, is penetrated by it on every surface. The bridge arches up where the ground drops off suddenly and there is a sensation of being airborne, causing a little vertigo and a quick check of your footing which is now suspended above a fifty-foot drop over jagged rocks on a see-through floor. 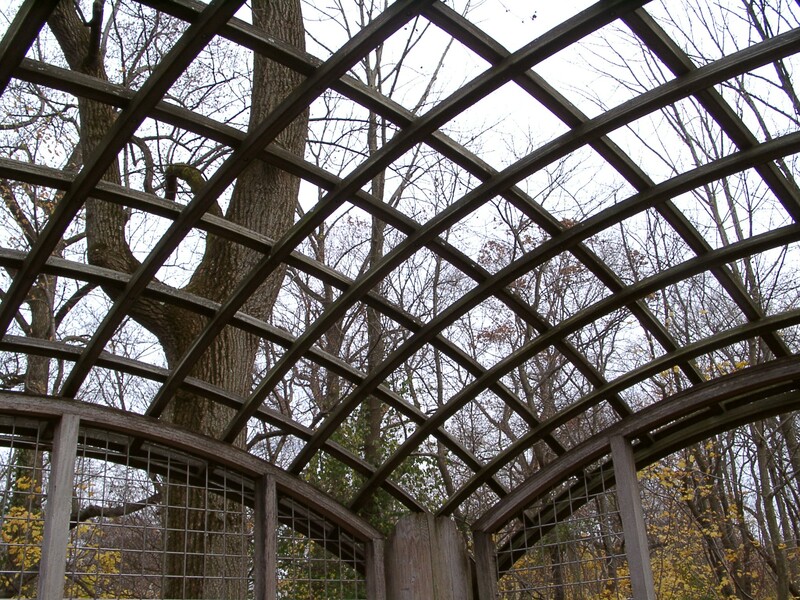 Being inside the span feels like walking through an aerial arbor with its ribbed series of arches, and its perforated-metal covering allows dappled light to come through like filtering foliage. The best part is the sense that this is some vestige of a Victorian amusement ride – a caged apparatus that took the starch out of riders’ collars as they ascended the heights and enjoyed an intimacy with the splendors of nature. On one side, the impressively erosion-carved, moss-covered rocks are right there, brushing against the closely nestled bridge; on the other side is a straight downward drop to more rock and, eventually, the creek bed. 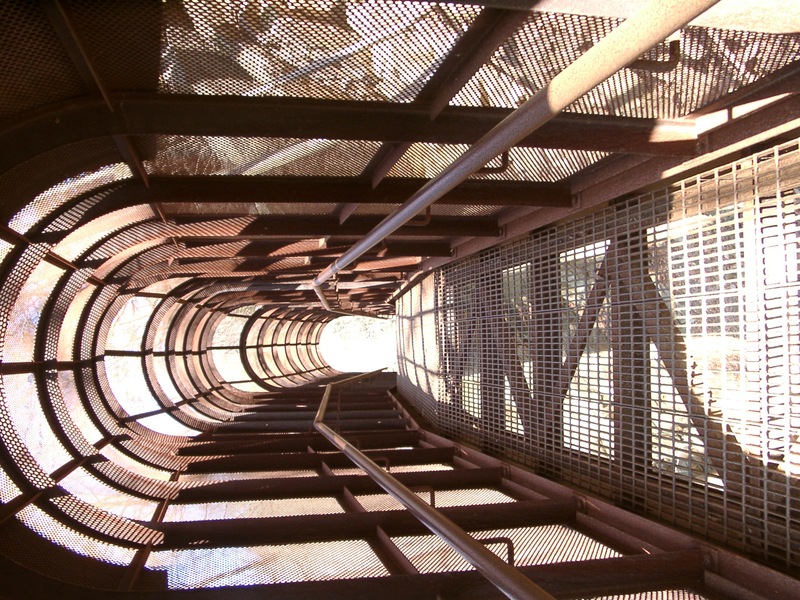 If you enter from the fingernail tip, as we did, you climb over much of the massive outcropping; then inside the span, you continue up as the finger arches to the apex of its second joint. From that point, you are working your way down toward the knuckle where it ends, and you begin your descent on a convenient series of fifty stone stairs with landings that wend their way to the creek. Many people approach it in the opposite direction, too, but it seems even more dramatic when you don’t have a real sense of how high up you are until you get there – the element of surprise being a big part of the equation. 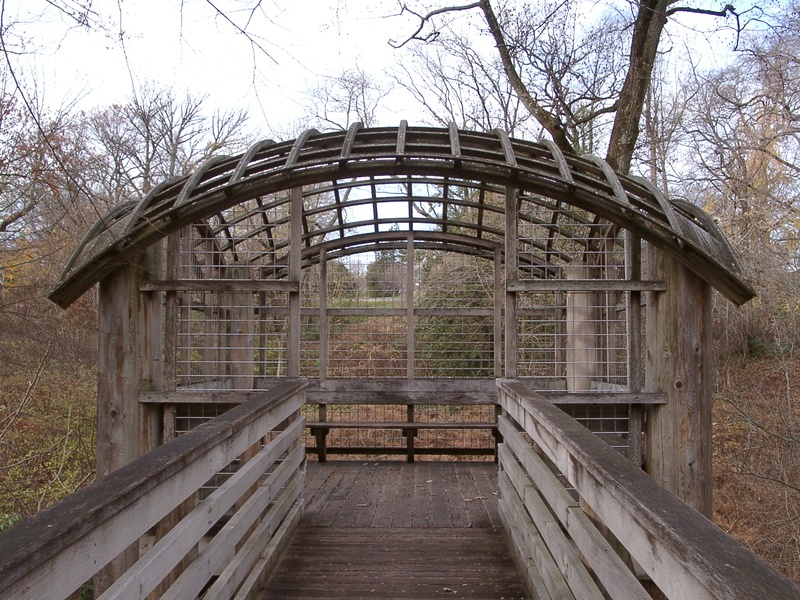 It is so unlikely that a 60-foot-long steel structure could provide so much interest and interaction with a deeply wooded ravine without being obtrusive, but it does. The contrasts are so great and, yet, they blend, providing an enhancement of both. Walking on that trail over the course of twenty years or more, we know it wouldn’t be the same experience without this added attraction. Our only regret is that we weren’t there during Fingerspan’s installation in 1987, watching the sections being lowered into place by helicopter – that being really the only way to get it there. But its being there now is as symbiotic as barnacles are on whales. 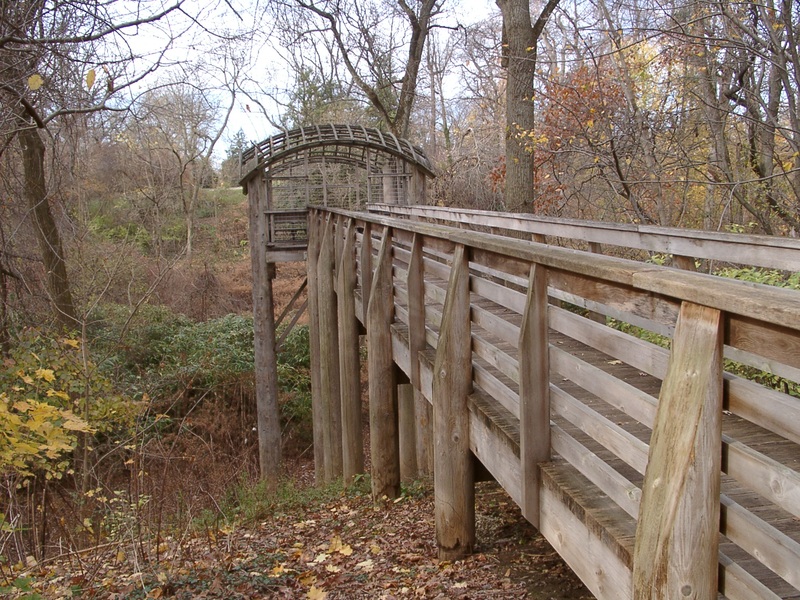 The Wissahickon Valley generally is about as dramatic a landscape as one could hope for, and Fingerspan adds some of its own drama – a match made in, well, an East Coast urban wilderness.